Category five Cyclone Winston hit Fiji on the evening of February 20th. One of the most powerful ever recorded in the region, it has left a trail of destruction affecting 347,000 people, including 120,000 children. The cyclone brought winds gusting up to 325km/h and waves rising up to 12 metres high. This is the largest natural disaster Fiji has ever experienced. Whole villages have been wiped out, crops have been raised to the ground and there has been significant damage to the country’s infrastructure. Fijian children and families are in desperate need of clean water, shelter and emergency supplies. Many of those affected are in remote communities and have lost everything, with 60,000 people forced into evacuation centres. 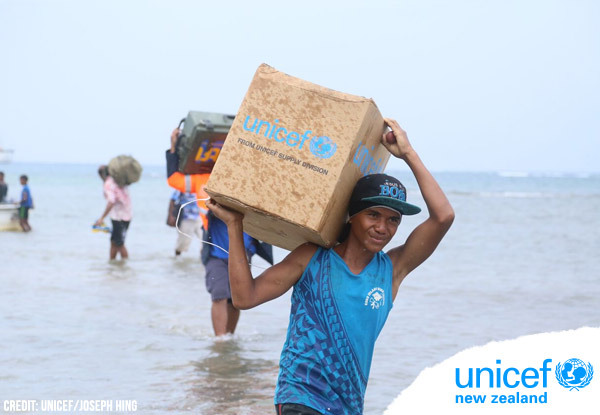 UNICEF New Zealand is working hard to deliver aid to the children and families affected. Their lives have been turned upside down, leaving many homeless and living in shelters with no clean water or emergency supplies. This is where UNICEF are focusing their work – delivering health and water kits, water purification tablets, tarpaulins, tents, and school-in-a-box kits. While these items are being packed up and distributed as quickly as possible, much more assistance is needed urgently. As the scale of the destruction becomes clearer and the needs of the people in Fiji change over the coming days and weeks, your support is critical in helping UNICEF be there. Click here to donate to UNICEF New Zealand and help the families and children of our Pacific neighbour recover from this devastating event.